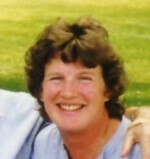 Patty Sackett Chrisman is one of the original members of the Sackett mailing list and of TSFA. She is originally from Portland, Oregon, but has lived on the East Coast for about 15 years and now lives in Maplewood, New Jersey with her husband Stephen and their sons James (10) and Thomas (6). Patty has a BFA (1982) and an MS (1990) in Historic Preservation from the University of Oregon. Prior to the birth of her children, Patty worked for four years as an Historian and Architectural Historian for the National Register of Historic Places at the National Park Service in Washington, D.C.
Patty has been involved in genealogy since her teens—predominantly as a way to find out about the ancestors of her much loved grandfather, Russell W. Sackett. Her grandpa’s parents divorced when he was very young, leaving him with no connection and no knowledge of his paternal family. Genealogy has proved to be quite compatible with her academic work—mostly studying the history and material culture of 17th and 18th century America. Patty truly enjoys research—particularly the use of primary documents. She is a big reader and knitting is a passion. Patty serves as Vice Chair of the Maplewood Historic Preservation Commission and also does a bit of consulting. She is active in the elementary school as a volunteer and is a Deacon in the Presbyterian Church. Patty and her family spend weekends in the summer and fall hiking and biking and in the winter and spring all weekends are spent skiing. Patty Sackett Chrisman has the distinction of being a double Sackett descendant following the marriage in her line of second cousins once removed Lieut David Sackett and Lucretia Shepard. Chart Lieut David Sackett & Lucretia Shepard relationship chart.